Asustek Computer on Monday unveiled two Eee Pad tablets running Windows software and an e-reader, the Eee Tablet, with a note-taking function. 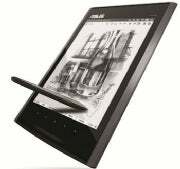 The company's e-reader, named the Eee Tablet, is designed for digital note-taking in addition to reading e-books. Asustek has sought to make the device a more educational tool by putting a 2-megapixel camera on board so students can take pictures of lecture slides as well, and sync the device to a laptop or desktop via a USB port or by using Micro SD cards.